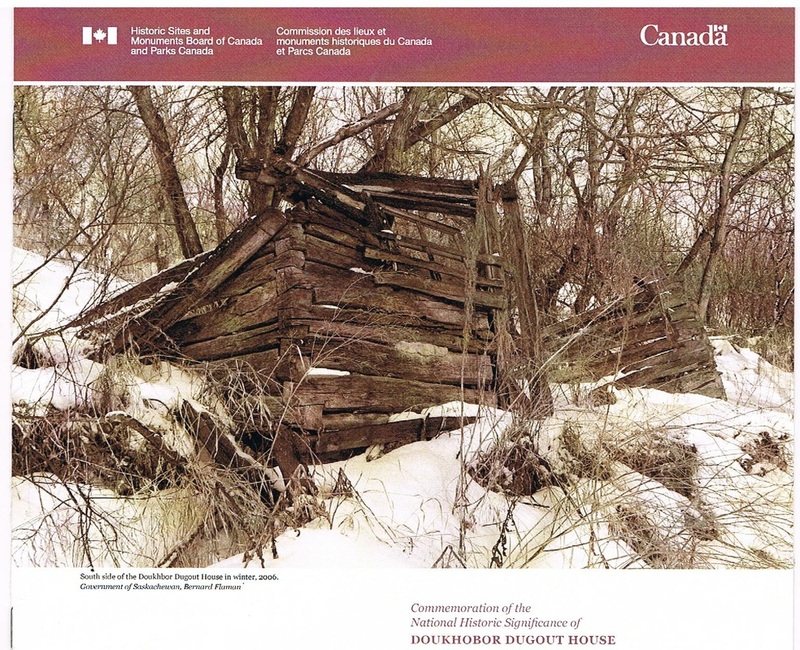 participate in the unveiling of the plaque commemorating the Doukhobor Dugout House as a national historical site by Historic Sites and Monuments Board of Canada. 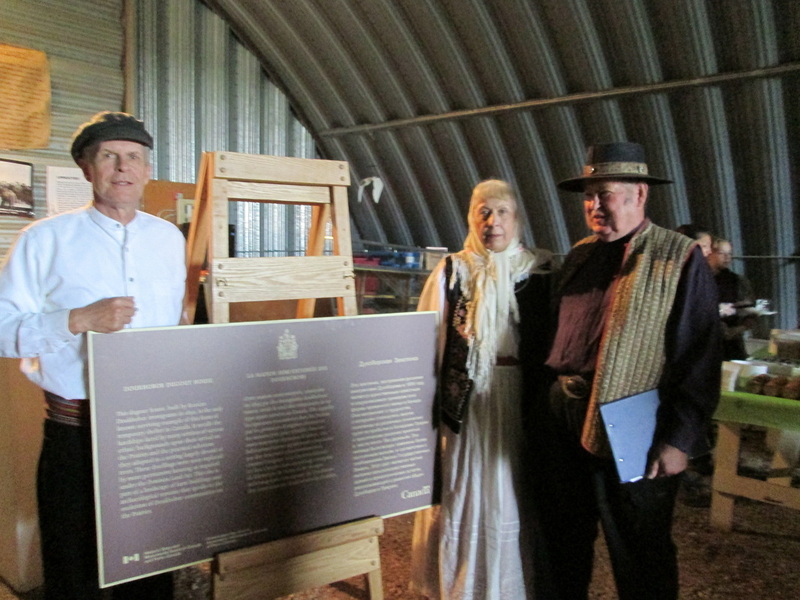 The Doukhobor Dugout House located south of Blaine Lake was recognized as a National Historic Site of Canada during an official ceremony July 5. 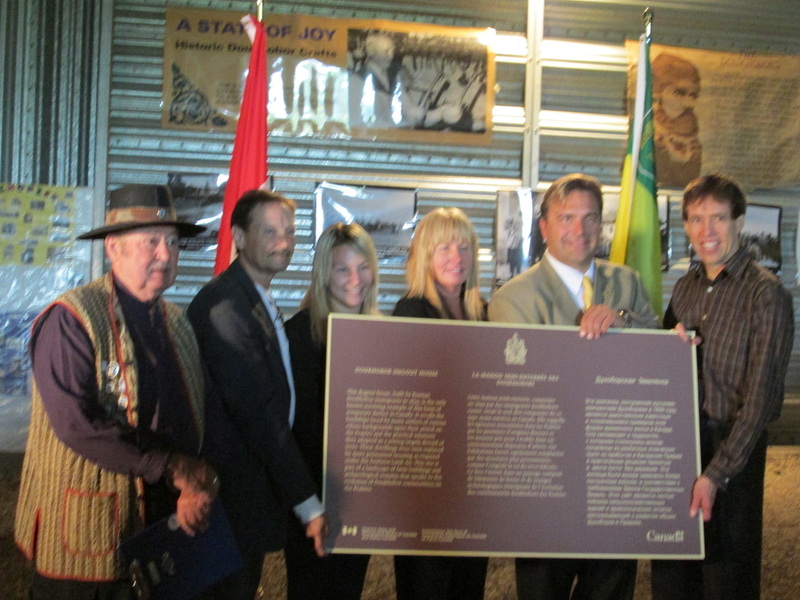 Maurice Vellacott, MP for Saskatoon-Wanuskewin, on behalf of Peter Kent, Canada's environment minister and minister responsible for Parks Canada, assisted with the unveiling of the Historic plaque. 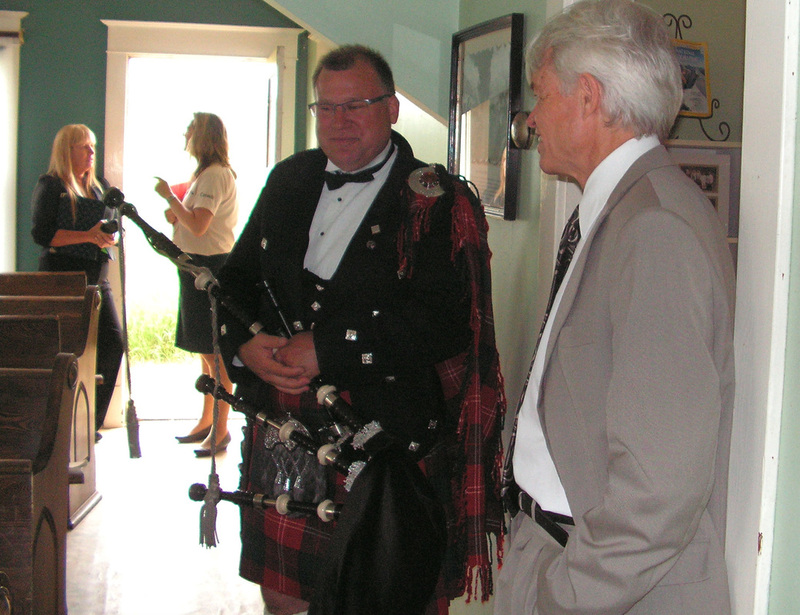 The dignitaries were led into the heritage site by Brad Fenty, a highland bagpiper. 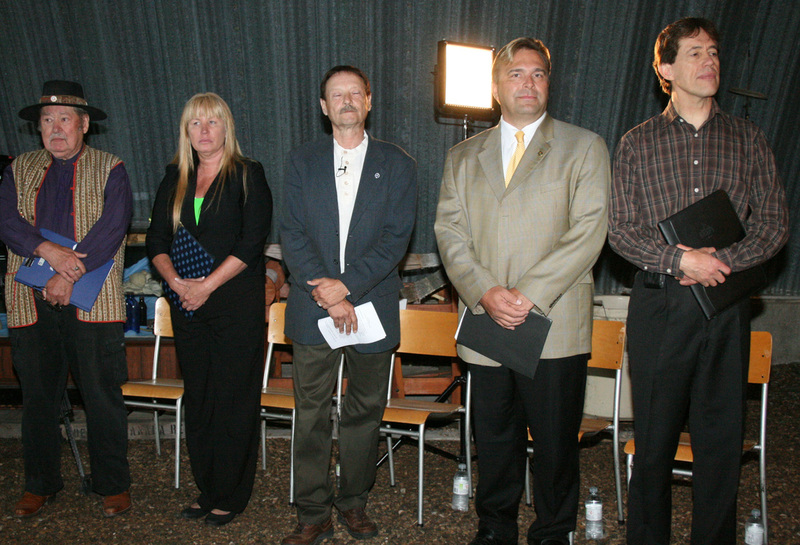 The program began with MC Allan Duddridge introducing the official party. Executive director for the Union of Spiritual Communities of Christ, J. J. Verigin, pronounced the opening prayer followed by Camilla Konkin singing the prayer in Russian. Konkin continued with the singing of O Canada. 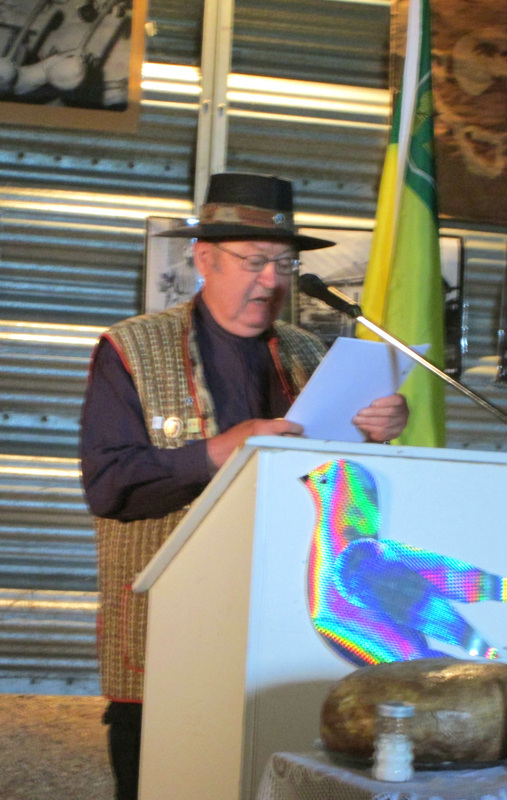 Duddridge, who is also Saskatchewan representative for the Historic Sites and Monuments Board of Canada; brought greetings on behalf of the national board. 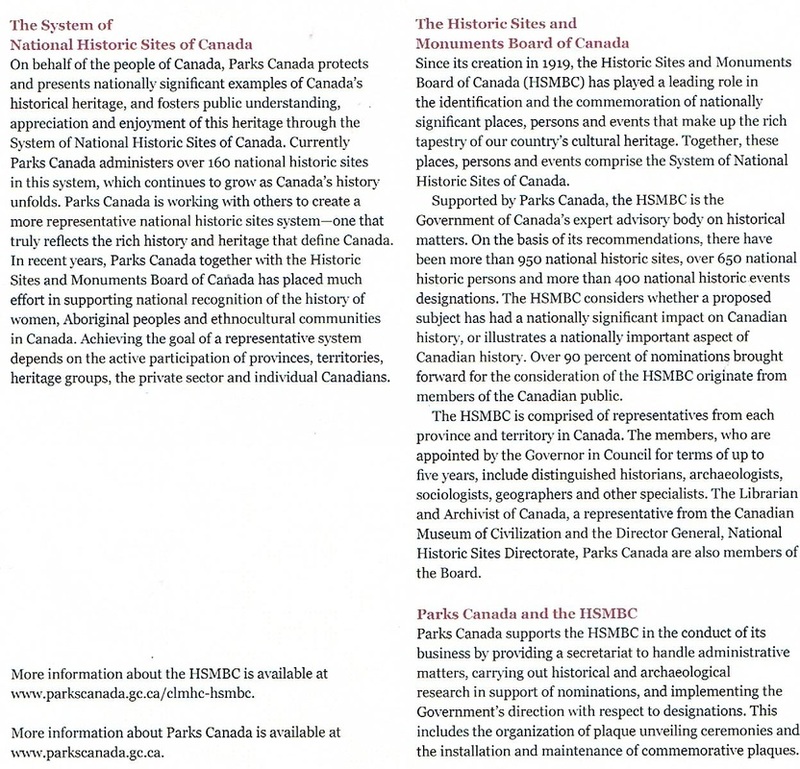 The Historic Sites and Monuments Board of Canada established in 1919 is supported by Parks Canada. It advises the minister of the environment on the national significance of places, people and events that have marked Canada's history. On behalf of the people of Canada, Parks Canada manages a nationwide network that depicts Canada's historical heritage and offers the public opportunities for discovery. 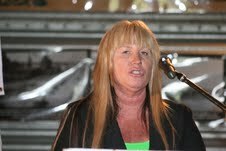 Brenda Cheveldayoff, site owner, expressed her appreciation to the many individuals who assisted her over the years in bringing to light the historical significance of the area. The dream began with her father's knowledge of and desire and ambition to acknowledge the roots of his culture. Also encouraging her mission to save the dugout house was finding an old National Geographic magazine among her late father's belongings whereby her grandfather had given an interview about the value of the site. That was when she decided it was time to explore whether the property was actually the site where the Doukhobors first settled. "It was his dream, his interest in the Dugout House that has brought me and my family closer to our Doukhobor heritage," explained Brenda through tear filled eyes. "During my journey I have had the opportunity to work with government and academic departments such as architecture, archaeology, environment, conservation and preservation, which has been very rewarding. 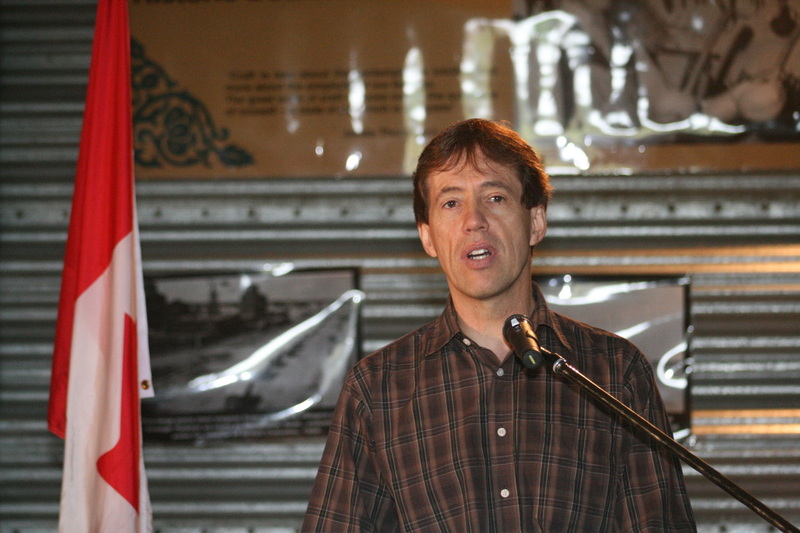 I have had the privilege of historians teaching me the historical facts of the Doukhobors." 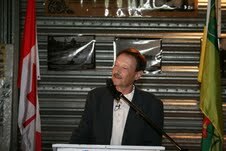 Ken Cheveldayoff, provincial minister of environment, brought greetings on behalf of the provincial government. "I am honoured to be here . 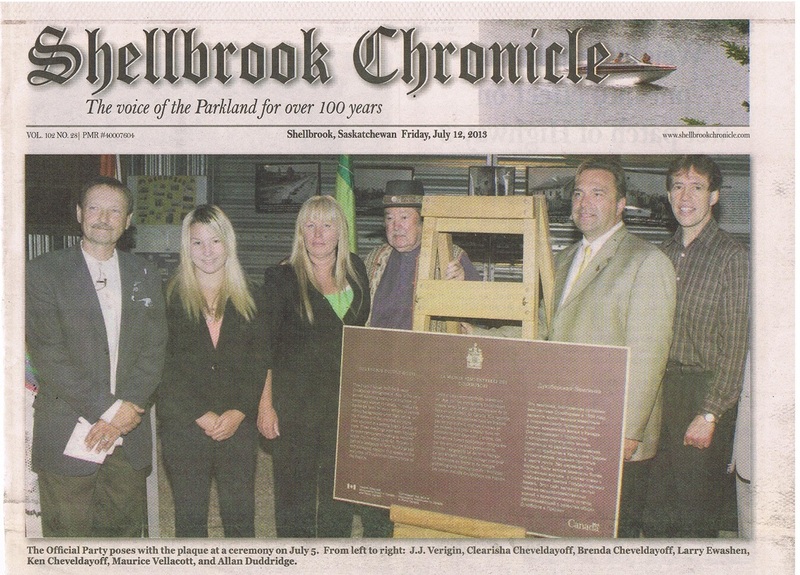 . . at this special ceremony commemorating the Doukhobor Dugout House. 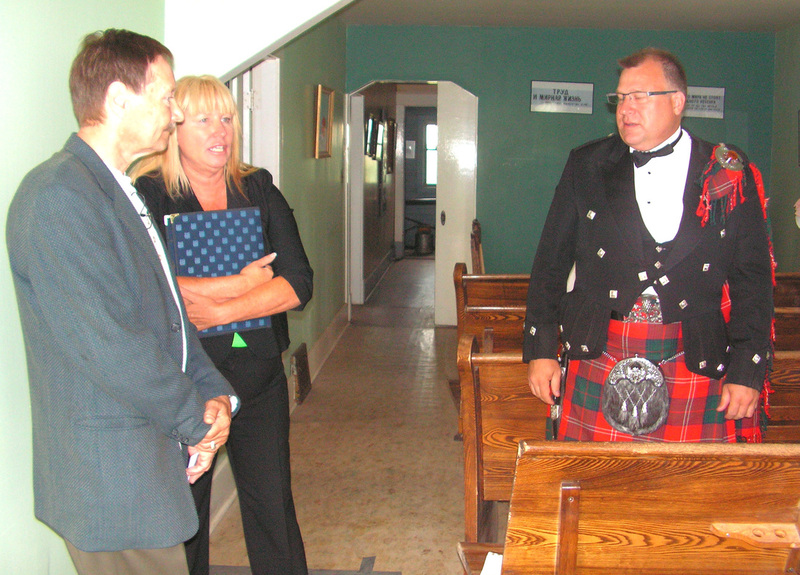 Brenda and Dan are passionate about this national historic site and I applaud them for all they have done," commented Ken, adding that the historic property is tied closely to the earliest history of the Doukhobors in Canada. "Your dedication to the property is the reason it will survive for generations," he said. "By providing tours you help ensure that the story of the early Doukhobors remains alive and vibrant in the minds of the more than one thousand who visit every year." Larry Ewashen, renowned historian on the Doukhobor culture, provided a verbal and pictorial presentation on the history of the Doukhobors. He spoke of the Immigration, the people and their struggles and the establishment of communities along the banks of the North Saskatchewan River. 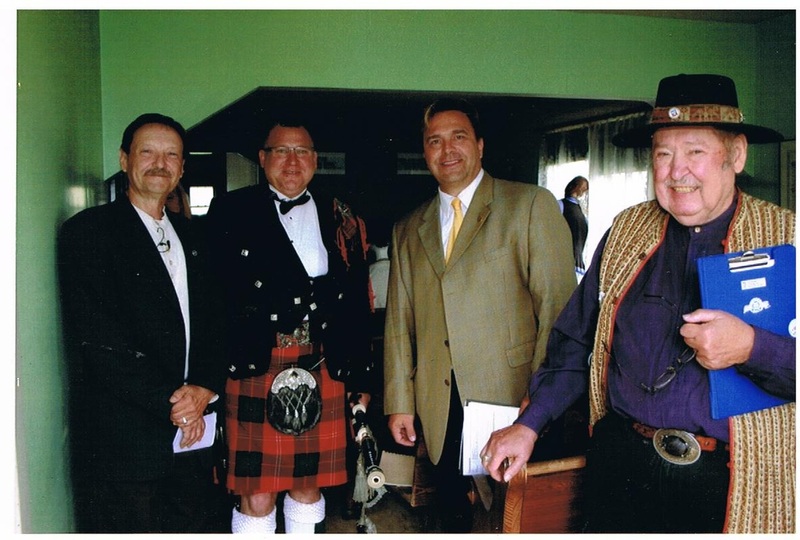 Ewashen has been instrumental in bringing Canadian Doukhobor sites to the attention of the Historic Sites and Monuments board. He has produced and directed documentary films and even wrote a prize winning musical soundtrack for The Herring Belt. 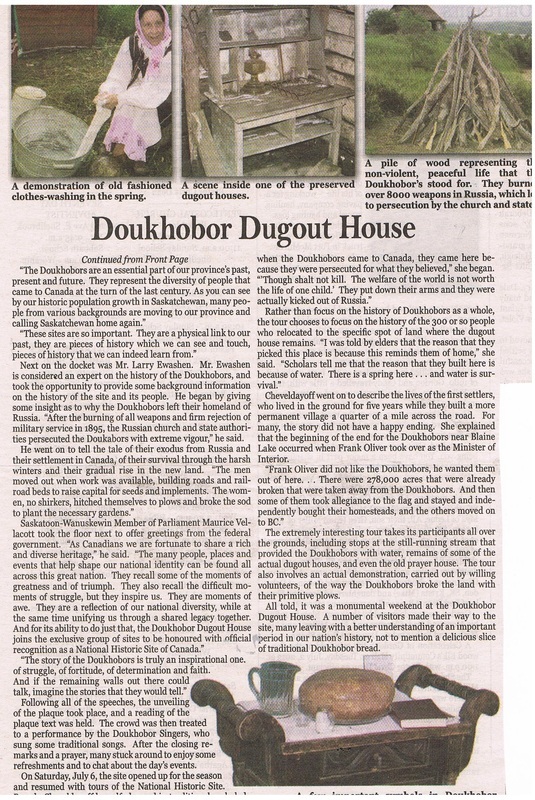 "The Government of Canada Is proud to welcome the Doukhobor Dugout House to our family of national historic sites," Vellacott said during his opening remarks. "This site celebrates the rich ethno-cultural heritage of this great country and is a testament to the ingenuity and tenacity of early settlers as they adapted to their prairie surroundings. It is a very significant reminder of the hardships, sacrifices and culture and of the basic necessities of life that we often take for granted. We can value the past and better appreciate the present and future." "You are safeguarding a remarkable legacy for the benefit of all Canadians," he commented, adding, "It is difficult for us to imagine a day filled with struggling to gather basic necessities that we take for granted. By valuing our past, we can begin to understand where we came from and better appreciate our present. That is the true value of our legacy." 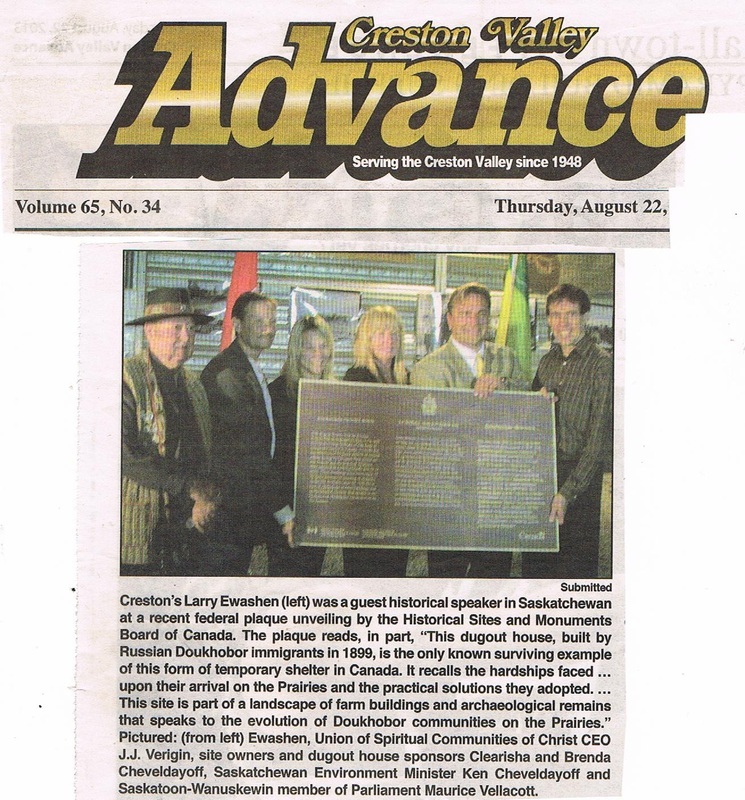 The dignitaries then gathered to participate in the unveiling of the plaque, which reads: "This dugout house, built by Russian Doukhobor immigrants in 1899, is the only known surviving example of this form of temporary shelter in Canada. It recalls the hardships faced by many settlers of various ethnic backgrounds** upon their arrival on the Prairies and the practical solutions they adopted in a setting largely devoid of trees. These dwellings were soon replaced by more permanent housing as required under the Dominion Lands Act***. This site is part of a landscape of farm buildings and archaeological remains that speaks to the evolution of Doukhobor communities on the Prairies." 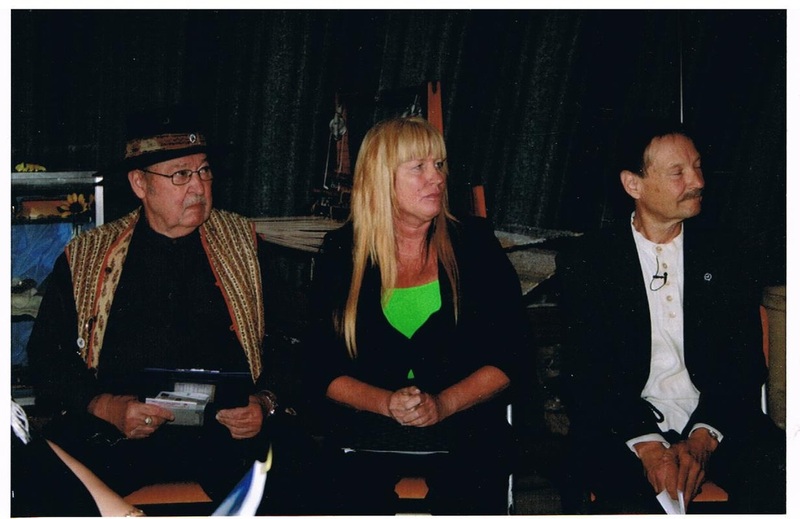 A few singers from the audience converged at the front to perform two traditional Doukhobor songs in Russian. The first, Precious Moments, relates to how thankful they are that God has given the tools to further teach the word of the Lord. The second hymn. Sleep, On You Great Fighting Eagles, represents the stand to honour their Russian forefathers. The hymn expresses the suffering of the Russian ancestors as they refused to go to war, they brought a legacy to "live in peace". 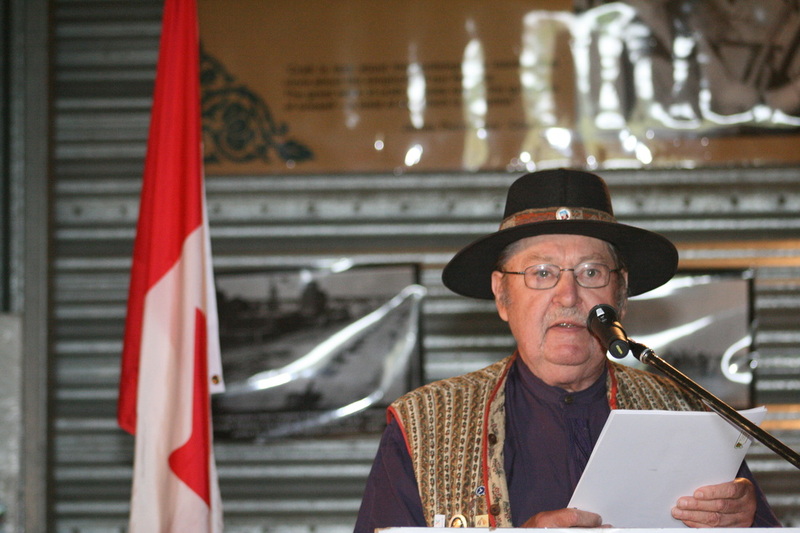 Veregin closed the ceremony with a Doukhobor prayer also considered a fundamental song that was written by an early Doukhobor leader entitled Be Devout. * This report is slightly edited to avoid repetition. ** As far as I've been able to discover in my research, the Doukhobors were the only pioneers who used dug out houses for shelter. 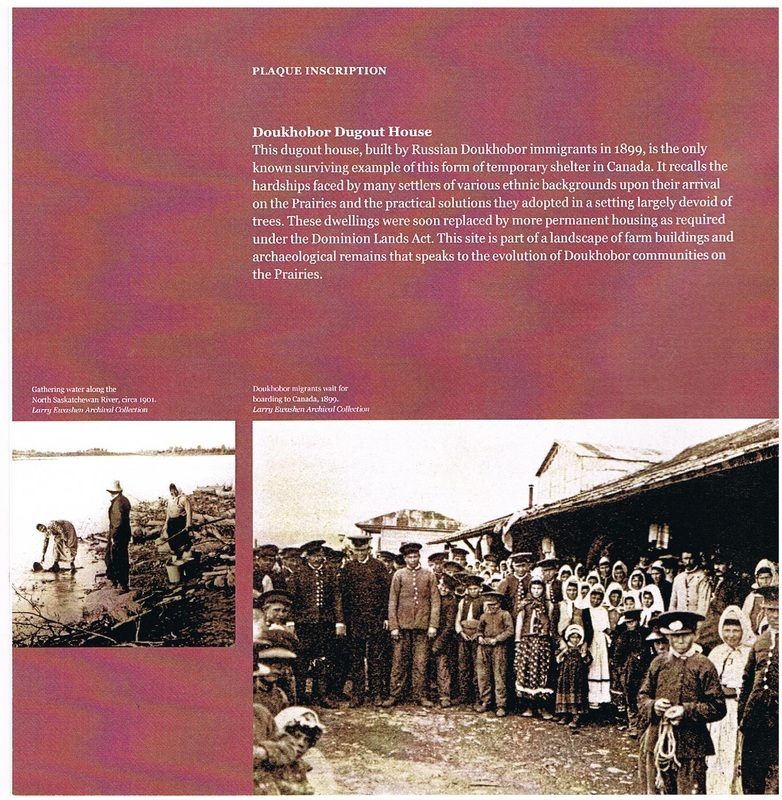 *** The Doukhobors were not subject to the provisions of the Dominion Lands Act. They settled under the provisions of The Hamlet clause, as noted in my talk. 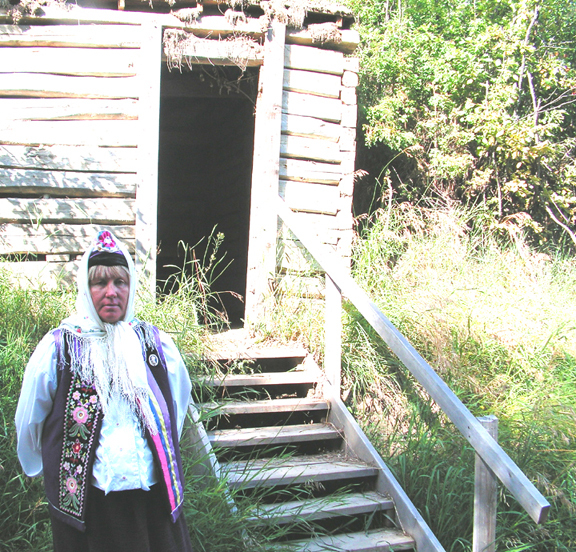 This Doukhobor Dugout House symbolizes the story of the Doukhobor migration to Canada. After the Burning of all weapons and firm rejection of military service in 1895, the Russian Church and state authorities persecuted the Doukhobors with extreme vigour. Substantial numbers perished in Siberian exile and penal battalions. The Russian government was content to erase this noxious group, until a committee headed by Lev Tolstoy and Vladimir Chertkov brought world wide attention to this criminality. 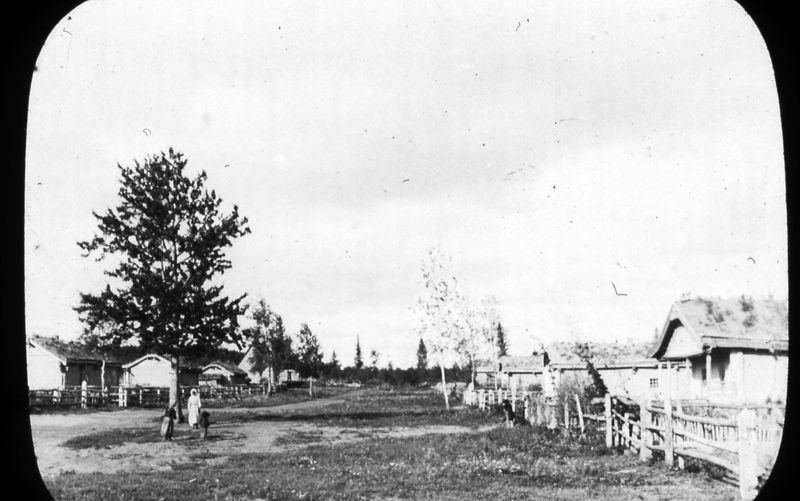 The Russian government was coerced to allow the Doukhobors to leave. 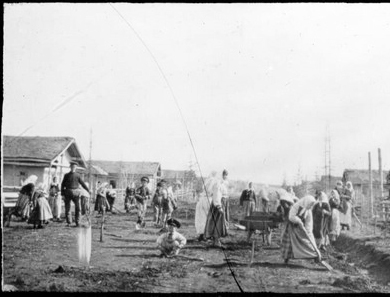 In 1899 approximately 7,400 Doukhobors settled on three large blocks of land in central and eastern Assiniboia. The Doukhobors were provided sanctuary at the behest of Clifford Sifton, Minister of the Interior, who saw in them ideal migrants to populate the empty central plains. Three conditions were approved: conscientious objector status, control of internal affairs and land in a ‘bloc’. Canada had a conscientious objector act since 1793, and the Doukhobors were added to the list by an order in council on December 6, 1898. Control of their internal structure was taken for granted. To allow them to farm communally, the Hamlet Clause was enacted replacing the requirements of the Homestead Act. The total land grant was 773,400 acres in three major areas. There were also three conditions stipulated by the Russian Imperial government: they must pay their own way, leave immediately, and leave their identity papers behind so they could never return. Converted cattle ships, Lake Huron and Lake Superior, each made two voyages between Dec. 23, 1898 and June 21, 1899. The timing necessitated by the ‘leaving immediately’ was awkward. The two ship loads arriving in January presented problems as it was the middle of winter and the Northwest Territories was largely undeveloped. 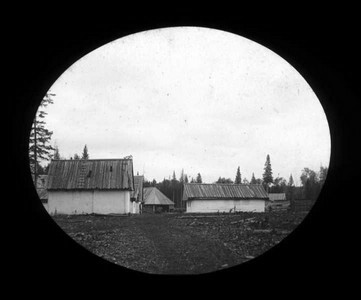 Some of the migrants wintered in immigration sheds in Winnipeg, Selkirk, Dauphin, Yorkton and Prince Albert, others were temporarily housed in large log structures more or less on site. 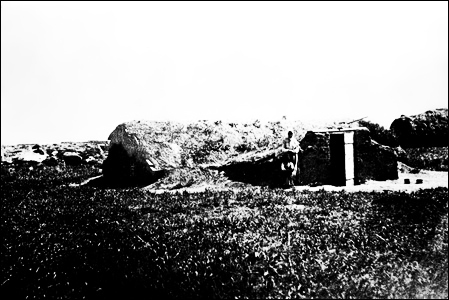 As they moved to the sites where future villages would blossom, on site shelters were necessary. These were rudimentary log and sod structures, tents, and make shift shelters made with poplar poles and turf. Where there was a hill side, the dug out was employed. These dugouts were modeled on houses known as zemlyanki originally used in the Caucasus. [From zemla, which means earth in Russian]. Modern scholarship indicates that they were the sole immigrants who employed the dug out house, though other settlers did build sod shanties. With winter is the knowledge that spring is coming, with spring is planting if you expect to eat. The men moved out when work was available, building roads and railroad beds, to raise capital for seed and implements. 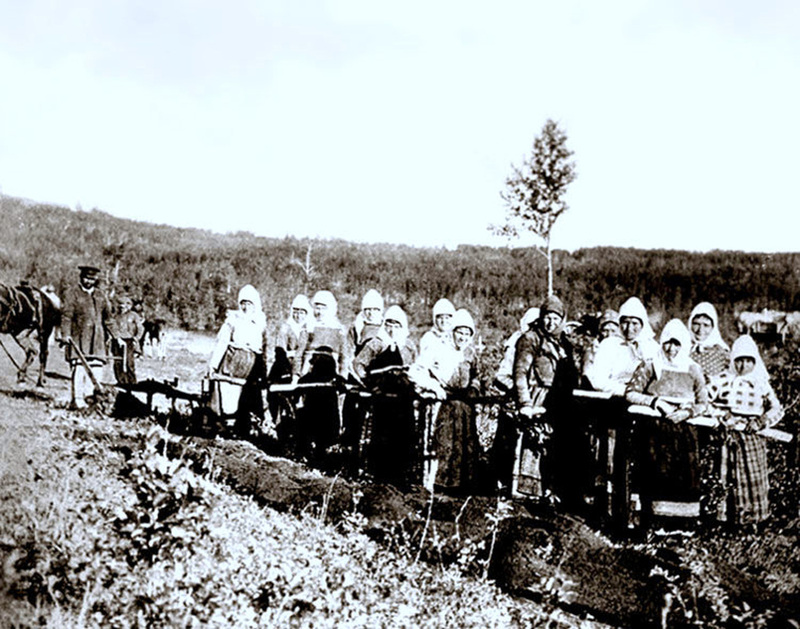 The women, no shirkers, hitched themselves to ploughs and broke the sod to plant the necessary gardens. Primitive Assiniboia was an inhospitable place for vegetarians. As villages were constructed the dug outs were abandoned, or sometimes preserved for storage space and root cellars. The Doukhobor Dugout House we are commemorating was one of several such dwellings gouged into hillsides in the early settlement. Unlike other dugouts, which were ploughed over or gradually returned to their native state, this example remained intact. It recalls the daunting challenges faced by these settlers and the practical ways in which they overcame them. 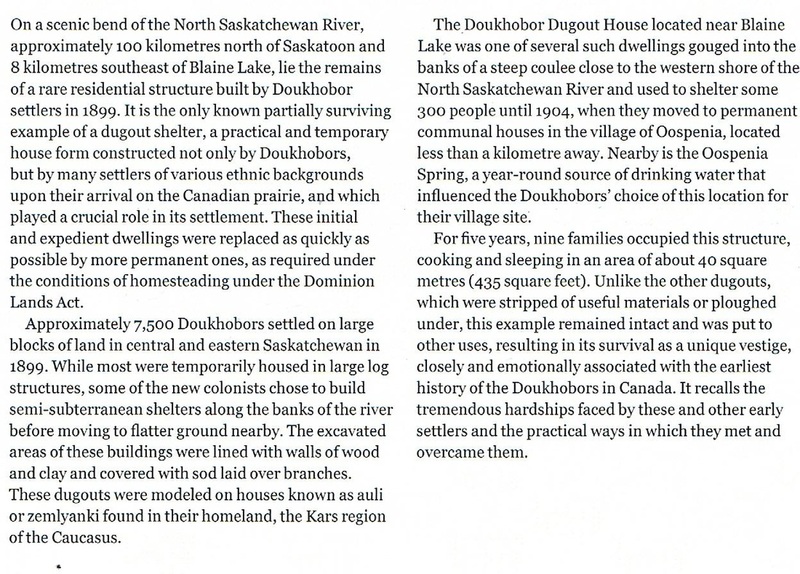 While little is taught in our school system about these important Doukhobor pioneers before Saskatchewan became a province, the preservation of this heritage site provides tangible proof of this pioneering spirit so the concerned and curious can search out such important historical facts. A slight delay . . .
Brenda explains . . .
Larry explains . . .